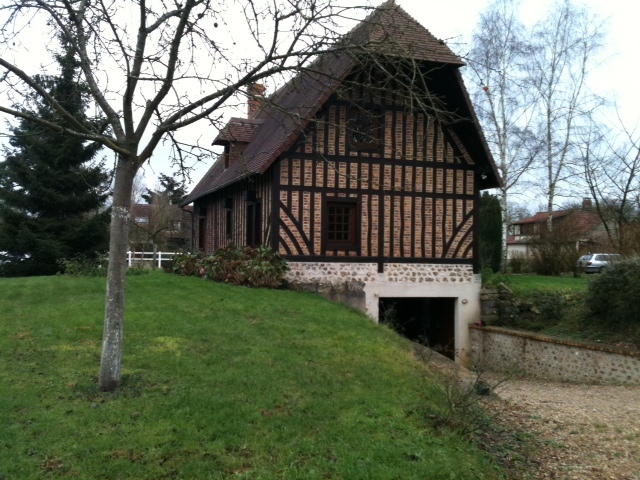 The little village of Le Mesnil Jourdain in Normandy has some wonderful half-timbered houses, both new and old, in addition to the manor house we stayed in over Christmas. Can you tell the old from the new in the ones below? The oak structure was built first and the holes filled in with wattle-and-daub (upright branches interwoven by smaller branches and covered by a thick coat of clay mud), laths and plaster, or bricks. Nowadays, they are usually renovated with concrete and whitewashed. 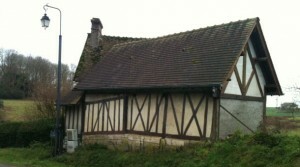 The misshapen walls on these old half-timbered buildings are the result of age and not sloppy craftsmenship of course. This one has a thatched roof. Irises are often planted on a bed of clay along the roof ridge. 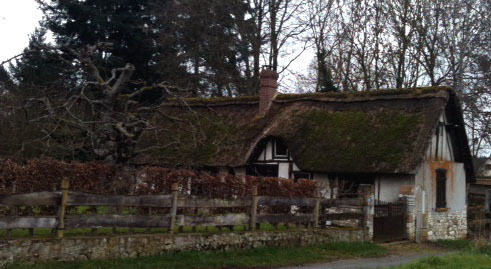 This is to make sure the ends of the thatch are firmly anchored in place. From this side, you can tell it’s of recent construction but from the other side, only the regularity of the timbering gives it away. 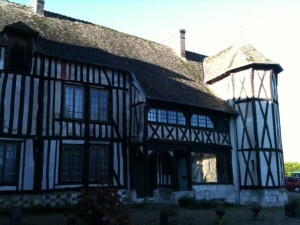 Once the main building was finished, the towers were added to one end to take the staircase up to the upper floors. 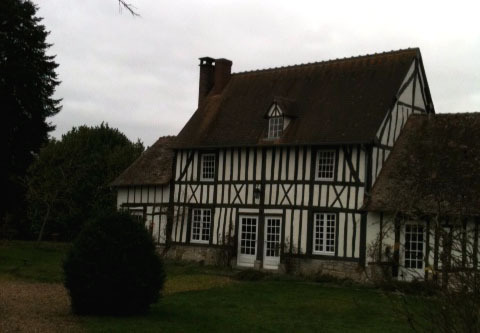 This entry was posted in France, French customs and tagged Normandy, thatched roofs. Bookmark the permalink.